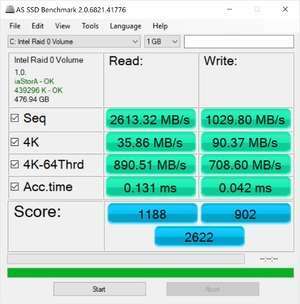 AS SSD Benchmark is a simple and portable utility which helps you measure the effectiveness and performance of any solid state (SSD) drives connected to your system. The main user interface here is minimalistic and allows you to get right down to testing speeds. To start, select the drive in the top-left corner and then hit "Start" at the bottom of the program. It will test "Seq", "4K", "4K-64Thrd" and Access Time. Version 2.0.6821.41776 is a freeware program which does not have restrictions and it's free so it doesn't cost anything. For security reasons, you should also check out the AS SSD Benchmark download at LO4D.com which includes virus and malware tests. Additional screenshots of this application download may be available, too.